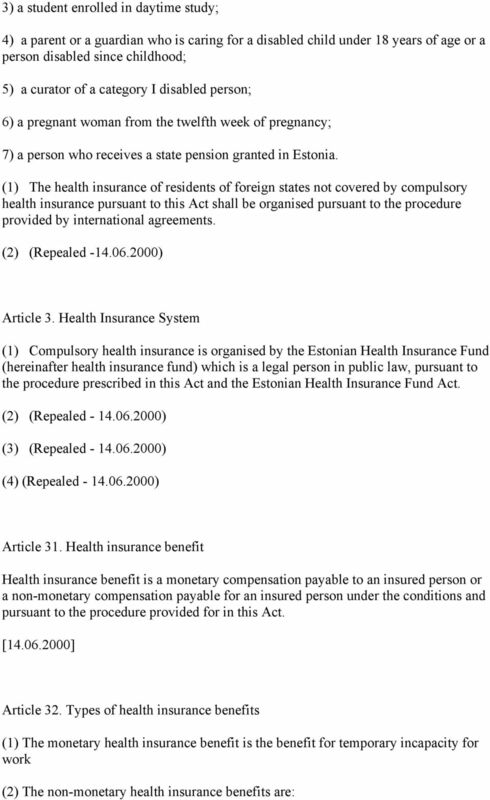 Download "The Republic of Estonia Health Insurance Act"
3 1) health or other service provided for health promotion, disease prevention or treatment; 2) medicinal products distributed at a discount, to the extent covered by the health insurance fund. [ ] II. HEALTH INSURANCE TAXES Article 4. [Repealed ] Article 5. [Repealed ] III. 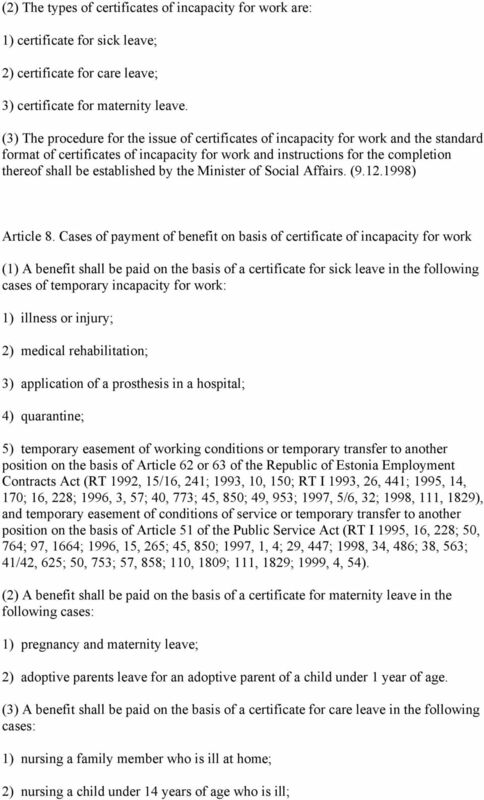 PAYMENT OF BENEFIT FOR TEMPORARY INCAPACITY FOR WORK Article 6. Benefit for temporary incapacity for work (1) Benefit for temporary incapacity for work (hereinafter benefit) is financial compensation paid by the health insurance fund to an insured person on the basis of a certificate of incapacity for work if income subject to social tax is not received due to leave. (2) The classes of health insurance benefits are: 1) sickness benefit paid on the basis of a certificate for sick leave; 2) maternity benefit paid on the basis of a certificate for maternity leave; 3) care allowance paid on the basis of a certificate for care leave. ( ) Article 7. Certificate of incapacity for work (1) A certificate of incapacity for work is a document which certifies the temporary incapacity for work and leave of an insured person and which is issued as the basis for the grant and payment of a benefit. 5 3) caring for a child under 3 years of age (or a disabled child under 16 years of age) if the person caring for the child is ill or is in hospital due to childbirth. ( ) Article 9. Duration of payment of benefit (1) A benefit shall be paid to an insured person from the calendar day following the calendar day on which an initial certificate for sick leave is prepared: 1) in the case of illness, injury, medical rehabilitation or application of a prosthesis in a hospital, until the end of the leave indicated on the certificate for sick leave or until the day on which permanent incapacity for work is determined (inclusive), but for not more than 182 consecutive calendar days during one illness or, in the case of contraction of tuberculosis, for not more than 240 consecutive calendar days. 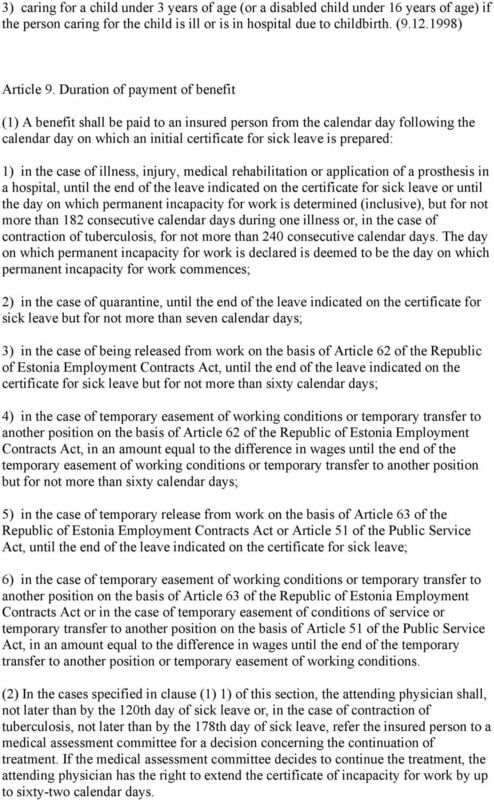 The day on which permanent incapacity for work is declared is deemed to be the day on which permanent incapacity for work commences; 2) in the case of quarantine, until the end of the leave indicated on the certificate for sick leave but for not more than seven calendar days; 3) in the case of being released from work on the basis of Article 62 of the Republic of Estonia Employment Contracts Act, until the end of the leave indicated on the certificate for sick leave but for not more than sixty calendar days; 4) in the case of temporary easement of working conditions or temporary transfer to another position on the basis of Article 62 of the Republic of Estonia Employment Contracts Act, in an amount equal to the difference in wages until the end of the temporary easement of working conditions or temporary transfer to another position but for not more than sixty calendar days; 5) in the case of temporary release from work on the basis of Article 63 of the Republic of Estonia Employment Contracts Act or Article 51 of the Public Service Act, until the end of the leave indicated on the certificate for sick leave; 6) in the case of temporary easement of working conditions or temporary transfer to another position on the basis of Article 63 of the Republic of Estonia Employment Contracts Act or in the case of temporary easement of conditions of service or temporary transfer to another position on the basis of Article 51 of the Public Service Act, in an amount equal to the difference in wages until the end of the temporary transfer to another position or temporary easement of working conditions. (2) In the cases specified in clause (1) 1) of this section, the attending physician shall, not later than by the 120th day of sick leave or, in the case of contraction of tuberculosis, not later than by the 178th day of sick leave, refer the insured person to a medical assessment committee for a decision concerning the continuation of treatment. If the medical assessment committee decides to continue the treatment, the attending physician has the right to extend the certificate of incapacity for work by up to sixty-two calendar days. 6 (3) A benefit shall be paid to an insured person from the day on which the certificate for maternity leave is prepared (inclusive): 1) in the case of pregnancy and maternity leave, for not more than 126 calendar days, or in the case of a multiple birth or a delivery with complications, for not more than 140 calendar days; 2) in the case of adoptive parents leave for an adoptive parent of a child under 1 year of age on the basis of a certificate for maternity leave, for seventy calendar days as of the date of adoption. 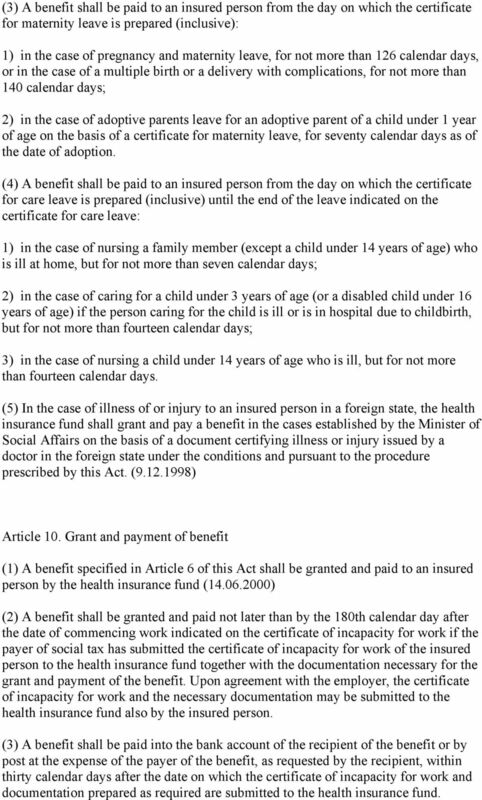 (4) A benefit shall be paid to an insured person from the day on which the certificate for care leave is prepared (inclusive) until the end of the leave indicated on the certificate for care leave: 1) in the case of nursing a family member (except a child under 14 years of age) who is ill at home, but for not more than seven calendar days; 2) in the case of caring for a child under 3 years of age (or a disabled child under 16 years of age) if the person caring for the child is ill or is in hospital due to childbirth, but for not more than fourteen calendar days; 3) in the case of nursing a child under 14 years of age who is ill, but for not more than fourteen calendar days. 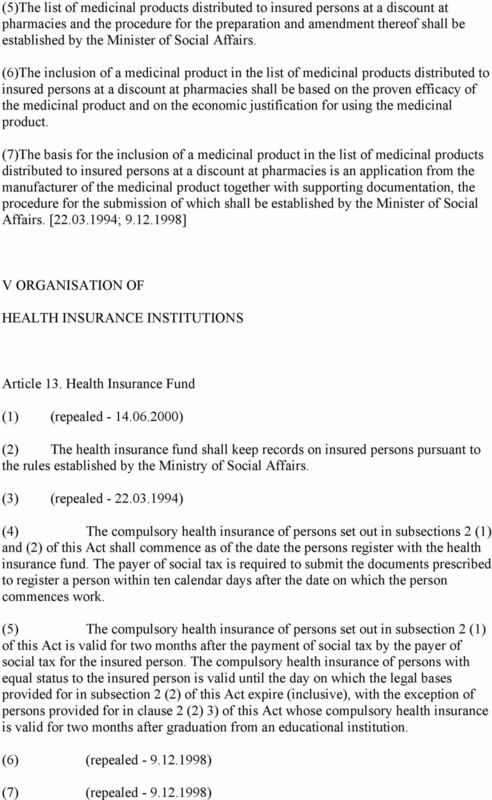 (5) In the case of illness of or injury to an insured person in a foreign state, the health insurance fund shall grant and pay a benefit in the cases established by the Minister of Social Affairs on the basis of a document certifying illness or injury issued by a doctor in the foreign state under the conditions and pursuant to the procedure prescribed by this Act. ( ) Article 10. 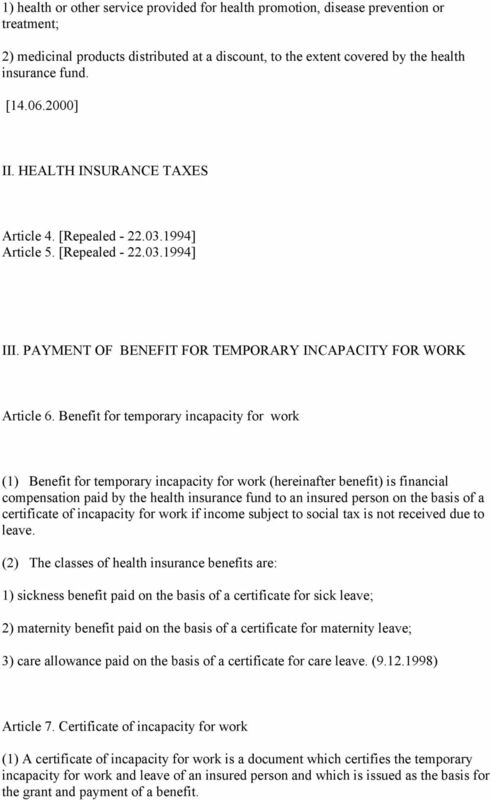 Grant and payment of benefit (1) A benefit specified in Article 6 of this Act shall be granted and paid to an insured person by the health insurance fund ( ) (2) A benefit shall be granted and paid not later than by the 180th calendar day after the date of commencing work indicated on the certificate of incapacity for work if the payer of social tax has submitted the certificate of incapacity for work of the insured person to the health insurance fund together with the documentation necessary for the grant and payment of the benefit. Upon agreement with the employer, the certificate of incapacity for work and the necessary documentation may be submitted to the health insurance fund also by the insured person. (3) A benefit shall be paid into the bank account of the recipient of the benefit or by post at the expense of the payer of the benefit, as requested by the recipient, within thirty calendar days after the date on which the certificate of incapacity for work and documentation prepared as required are submitted to the health insurance fund. 9 2) in the case of out-patient treatment, out-patient medical rehabilitation, day care surgery and procedures, nursing a family member over 14 years of age who is ill at home, or caring for a child under 3 years of age (or a disabled child under 16 years of age) if the person caring for the child is ill or is in hospital due to childbirth 80%; 3) in the case of an accident at work or incapacity for work arising during protection of the interests of the state or society or prevention of a criminal offence, or in the case of occupational disease, nursing a child under 14 years of age who is ill at home, pregnancy and maternity leave, or adoptive parents leave for an adoptive parent of a child under 1 year of age 100%. 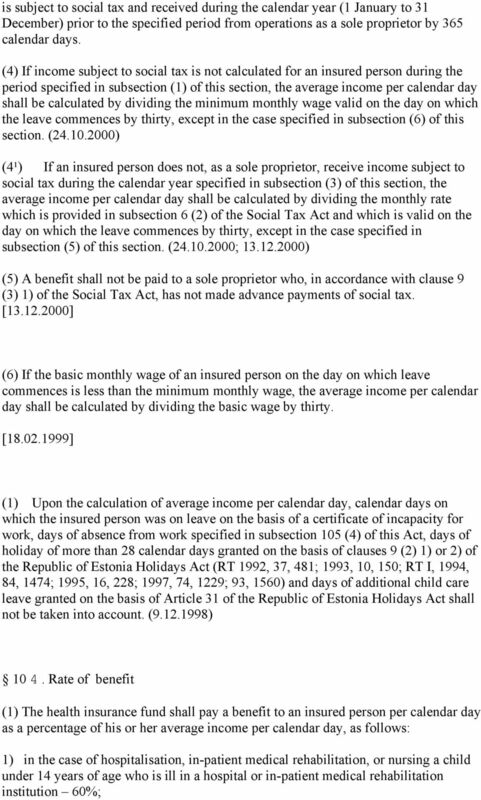 (2) In the case of temporary release from work or from performance of functions on the basis of Articles 62 or 63 of the Republic of Estonia Employment Contracts Act or Article 51 of the Public Service Act, a benefit shall be paid per calendar day to the insured person at a rate of 80 per cent of his or her average income per calendar day. 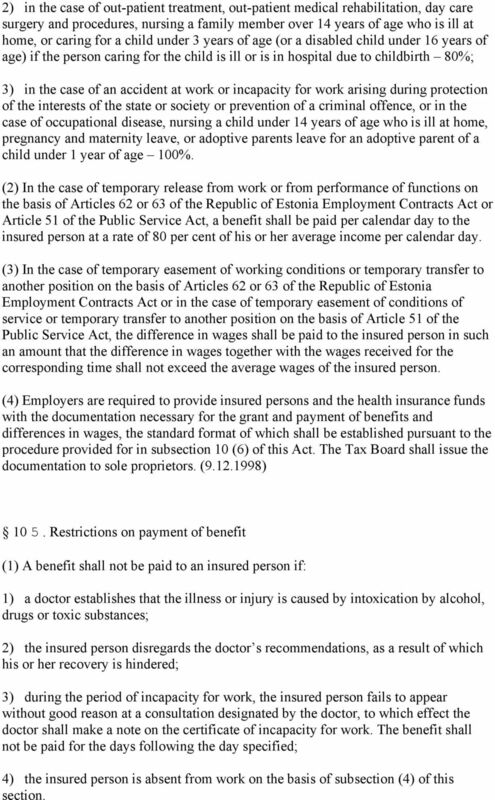 (3) In the case of temporary easement of working conditions or temporary transfer to another position on the basis of Articles 62 or 63 of the Republic of Estonia Employment Contracts Act or in the case of temporary easement of conditions of service or temporary transfer to another position on the basis of Article 51 of the Public Service Act, the difference in wages shall be paid to the insured person in such an amount that the difference in wages together with the wages received for the corresponding time shall not exceed the average wages of the insured person. 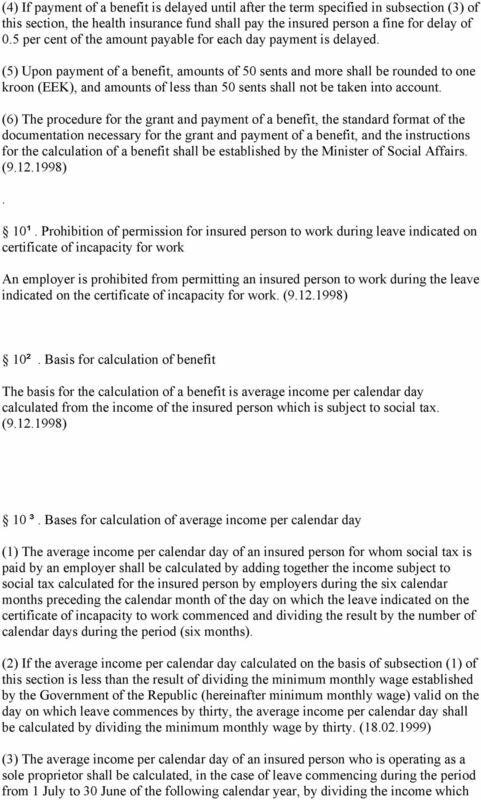 (4) Employers are required to provide insured persons and the health insurance funds with the documentation necessary for the grant and payment of benefits and differences in wages, the standard format of which shall be established pursuant to the procedure provided for in subsection 10 (6) of this Act. The Tax Board shall issue the documentation to sole proprietors. 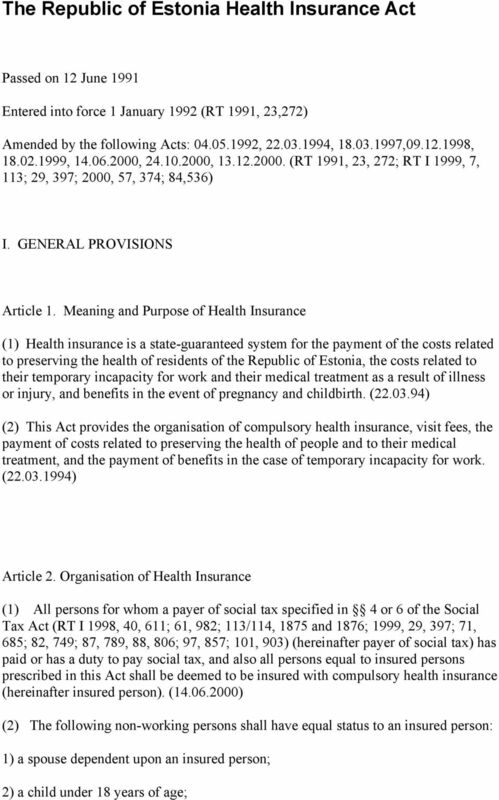 ( ) Restrictions on payment of benefit (1) A benefit shall not be paid to an insured person if: 1) a doctor establishes that the illness or injury is caused by intoxication by alcohol, drugs or toxic substances; 2) the insured person disregards the doctor s recommendations, as a result of which his or her recovery is hindered; 3) during the period of incapacity for work, the insured person fails to appear without good reason at a consultation designated by the doctor, to which effect the doctor shall make a note on the certificate of incapacity for work. The benefit shall not be paid for the days following the day specified; 4) the insured person is absent from work on the basis of subsection (4) of this section. 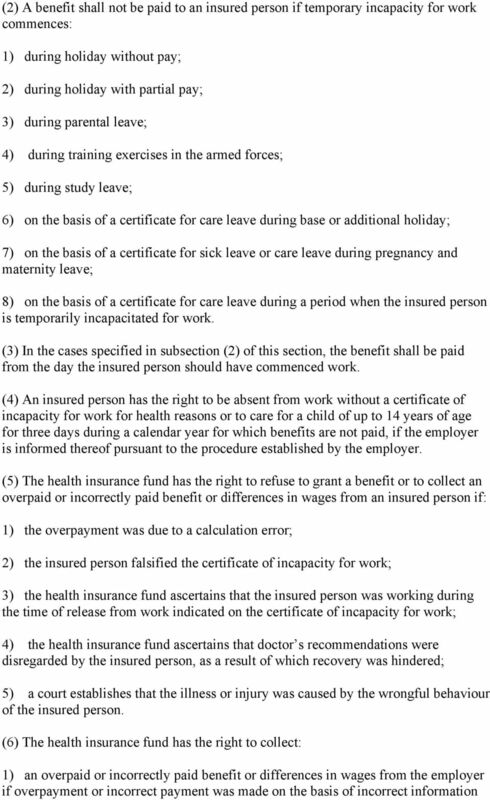 11 submitted by the employer or if the employer violates the provisions of Article 10¹ of this Act; 2) amounts granted as a benefit and paid for health services from the person guilty of causing the injury; 3) benefits paid to a person covered by compulsory health insurance from the health insurance budgetary funds due to a traffic accident, and the costs of health services rendered, from an insurer engaging in motor third party liability insurance, if the right of claim of the person covered by compulsory health insurance arises against the insurer engaging in motor third party liability insurance; 4) the difference between the benefit paid at a rate of 100 per cent on the basis of clause 10 4 (1)3) of this Act as a result of an accident at work or an occupational disease and the benefit calculated at a rate of 60 per cent or 80 per cent, depending on the treatment regime, on the basis of clauses 10 4 (1) 1) or 2) of this Act, from the employer. Article 11 (Repealed ) IV COVERING OF COSTS OF MEDICAL TREATMENT Article 12. Payment for Medical Examination and Treatment (1) The costs of medical examinations, medical treatment and the preservation of the health of an insured person, except visit fees, shall be paid by the health insurance fund to the relevant medical or care institution or private physician, if the institution or physician has entered into a contract with the health insurance fund, proceeding from the volume of services provided and their cost. 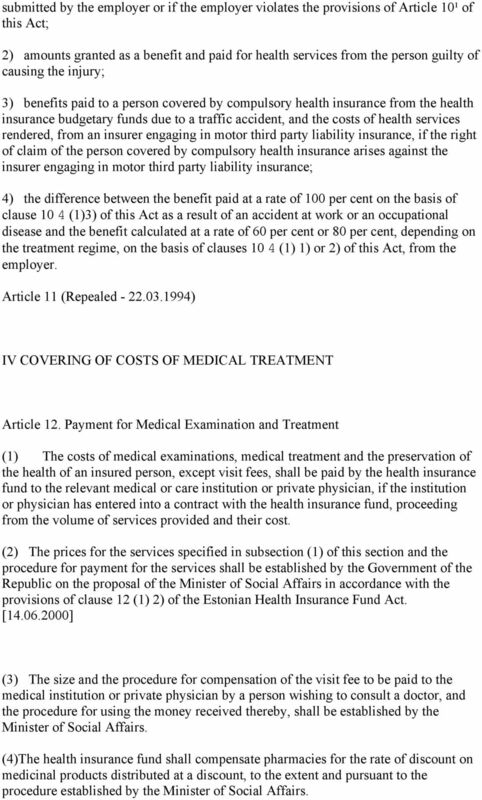 (2) The prices for the services specified in subsection (1) of this section and the procedure for payment for the services shall be established by the Government of the Republic on the proposal of the Minister of Social Affairs in accordance with the provisions of clause 12 (1) 2) of the Estonian Health Insurance Fund Act. [ ] (3) The size and the procedure for compensation of the visit fee to be paid to the medical institution or private physician by a person wishing to consult a doctor, and the procedure for using the money received thereby, shall be established by the Minister of Social Affairs. (4)The health insurance fund shall compensate pharmacies for the rate of discount on medicinal products distributed at a discount, to the extent and pursuant to the procedure established by the Minister of Social Affairs. 14 Article 16. [Repealed ] Article 17. This Act enters into force on 1 January Extract from the Act of (RTI 1998, 111, 1829; 113/114, 1876) Article 5. Implementing provisions (1) This Act enters into force on 1 January (1¹ ) From 1 January 1999 to 1 April 1999, the following persons shall have equal status to the persons set out in subsection 2 (2) of the Republic of Estonia Health Insurance Act: 1) persons on parental leave with a child of up to 3 years of age, or one non-working parent raising a child of up to 3 years of age; 2) non-working spouses of diplomats serving in foreign missions; 3) conscripts in the compulsory service of the Defence Forces; 4) disabled persons working in a manufacturing enterprise of an association of disabled persons (as defined in clause 5 (1) 3) of the Income Tax Act); 5) persons registered as unemployed. 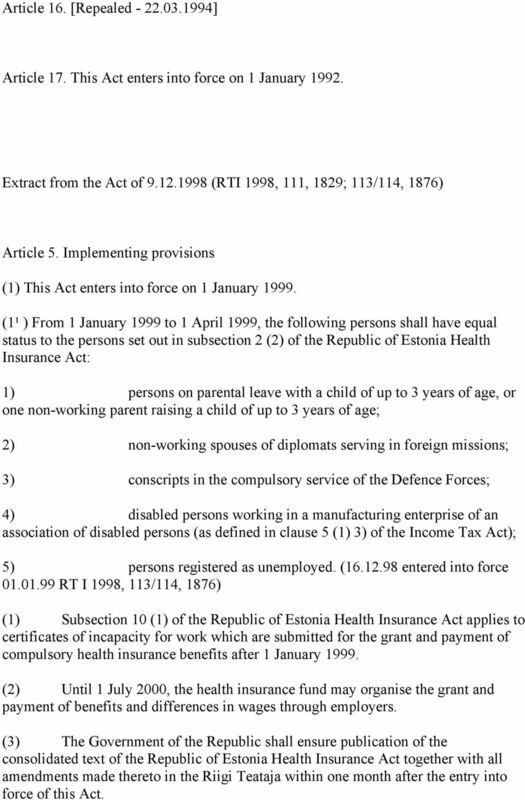 ( entered into force RT I 1998, 113/114, 1876) (1) Subsection 10 (1) of the Republic of Estonia Health Insurance Act applies to certificates of incapacity for work which are submitted for the grant and payment of compulsory health insurance benefits after 1 January (2) Until 1 July 2000, the health insurance fund may organise the grant and payment of benefits and differences in wages through employers. (3) The Government of the Republic shall ensure publication of the consolidated text of the Republic of Estonia Health Insurance Act together with all amendments made thereto in the Riigi Teataja within one month after the entry into force of this Act. WAGE PROTECTION LAW, 5718-1958 Definitions. Due to pay in cash. Payment in money s worth. Prohibitions of restrictions. Inclusive wage. Administrator means the administrator of giraffe & friends RESP, being Giraffe & Friends Life Insurance Company. Article 2 This Law shall govern mandatory pension and disability insurance based on generational solidarity.